A few days ago a friend of mine was ready to enter the Linux world (sic!). He downloaded a Fedora ISO but he didn’t have a blank CD to burn it. So he asked me for a way to install Linux through his Windows system. So, in this guide I will describe you how to install a Linux distribution from a Windows system so that you don’t have to burn a CD. 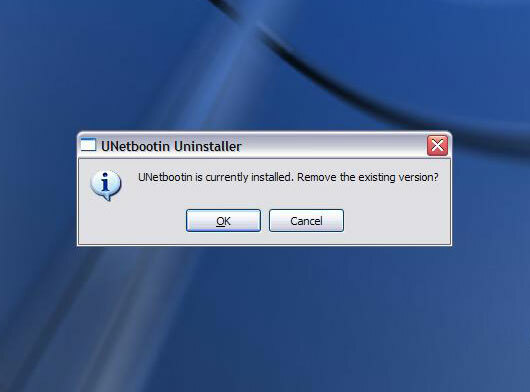 I will use a freeware application called UNetbootin. 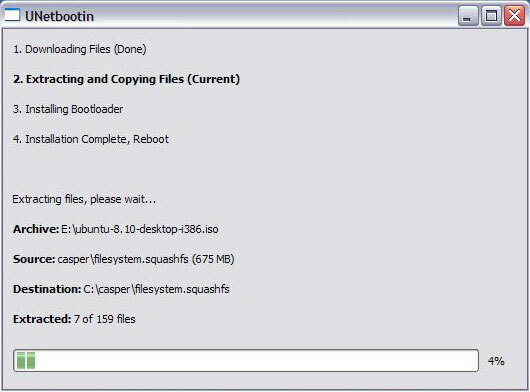 UNetbootin is a tool that allows you to either create bootable Live USB driers for a variety of Linux distributions such as (Fedora, Ubuntu, Debian, Gentoo, openSUSE etc.) or make a “frugal install” directly on your local hard disk drive if you don’t have a USB drive. It can both load distributions by automatically downloading the ISO images or by using existing ISO files. Apart from a Windows 2000/XP/Vista version it has Linux versions also with precompiled packages for Ubuntu, Debian, openSuse and Gentoo. Therefore, you can use it to install Linux from another Linux! 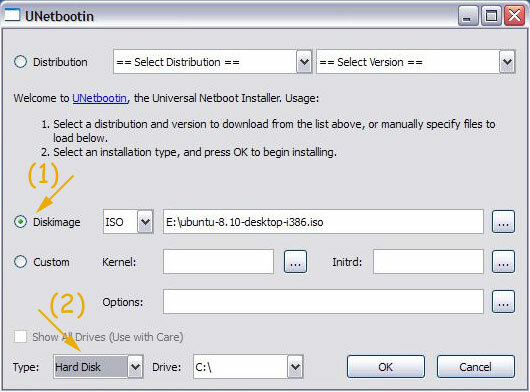 In this tutorial I have installed Ubuntu Iterpid Ibex 8.10, for which I had previously downloaded an ISO image, through a Windows XP system. 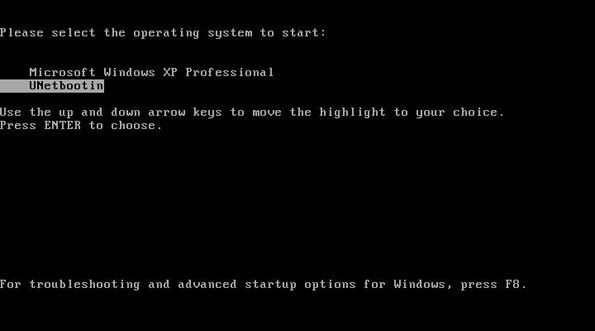 The procedure is the same to install any distribution through Windows and Linux. 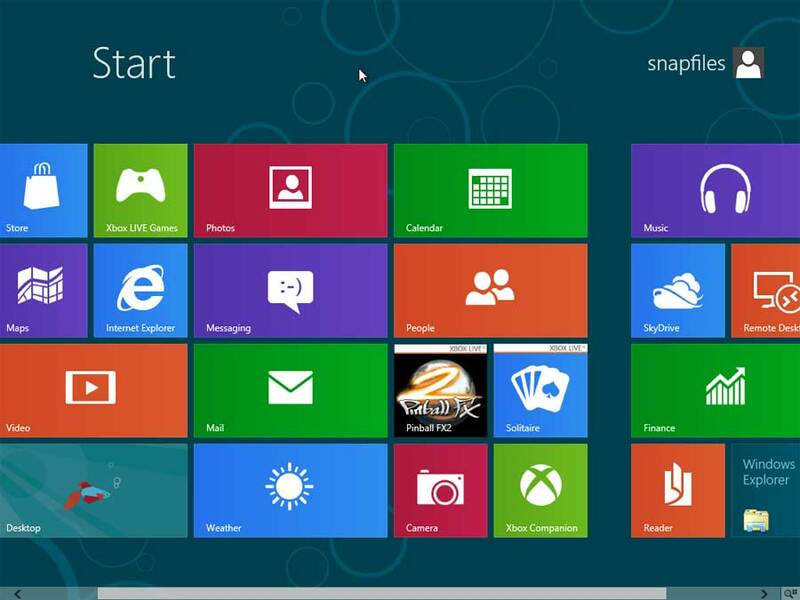 So download the latest stable version of UNetbootin and let’s get started. 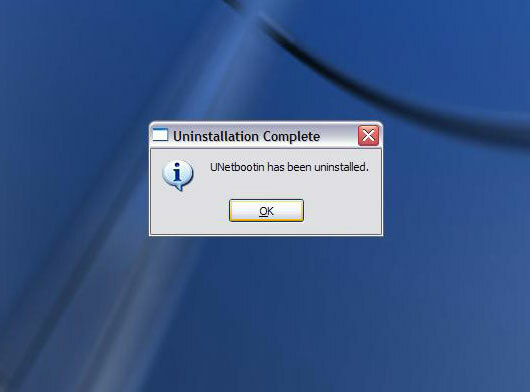 This is the main window of UNetbootin. 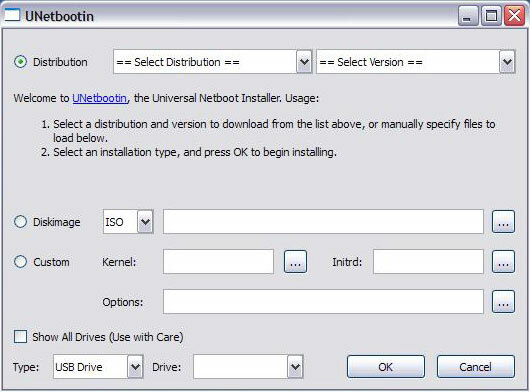 You can see the list of available distributions that UNetbootin can download for you. Various versions of each distro are supported. Apart from the Distribution and Diskimage options you can do a custom installation using a specific kernel and initrd as well as custom kernel options but I believe this will confuse most people and since it isn’t a common situation I won’t refer at all to this option. As I’ve said before I will not use the automatic download but the Ubuntu 8.10 LiveCD ISO (1) I have in my disk. Moreover I won’t use a USB driver. Just my hard disk (2). Of course if your motherboard supports booting from USB drives and you own a large enough USB drive select this one in the Type drop down box. 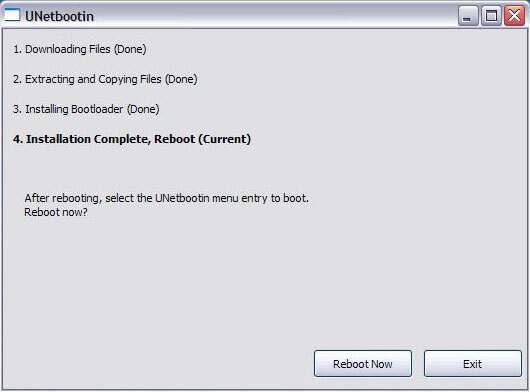 UNetbootin will download files (if you have chosen the download ISO option), extract files from the ISO image, copy them to a temporary image, install a bootloader and prompt you to reboot your system. When you reboot select UNetbootin from the list. Next click on the find /unetbtin/menu.lst option. 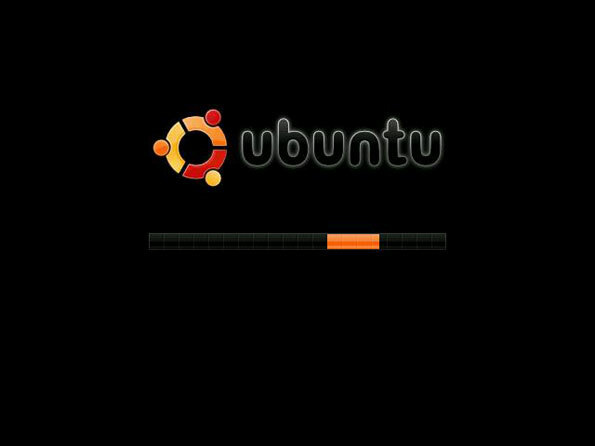 Ubuntu 8.10 is a LiveCD so just click the install icon to install it locally. I won’t post here details about the installation process of Ubuntu since this isn’t the subject of this unebootin guide. Just be very careful when you partition your system. You don’t want to install Linux on a existing Windows partition, do you? 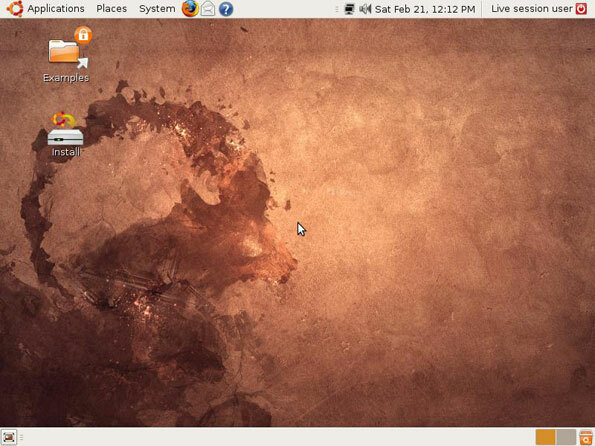 If you are interested you can read my Ubuntu Installation guide for more details. Once the installation completes just reboot your system and select Windows from the GRUB boot menu. 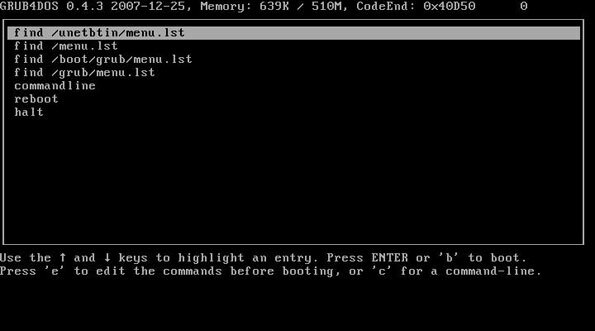 Another boot menu will appear, the Windows bootloader this time. Here choose again Windows. You will be prompted to Run UNetbootin.exe. This will automatically remove it from your system, along with the Windows bootloader. 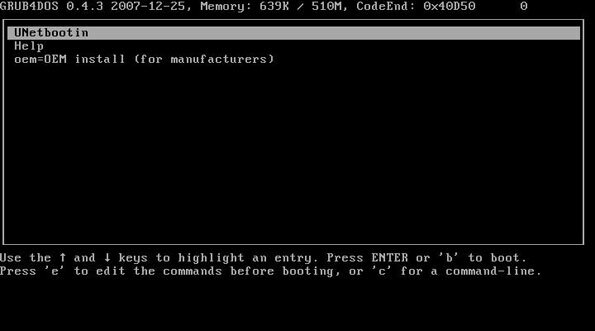 Now you have a dual boot Windows-Linux. Enjoy! Create symlink dev/root and then exit the shell to continue install. bug in initramfs /init detected. Dropping to a shell. Good luck! There is an open bug in RedHat’s bugzilla for this so there is nothing I can do. I don’t know if there is the same problem with the normarl Fedora DVD ISO. If anyone tries it just drop me a comment here.